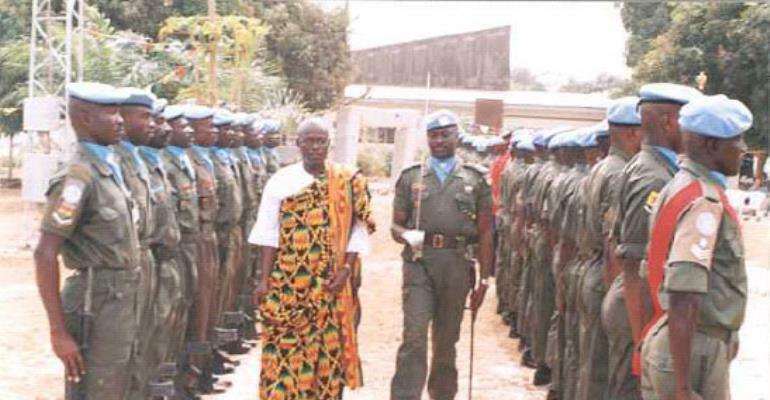 Current Ghanaian peacekeepers serving with the United Nations Mission in Sierra Leone(UNAMSIL), Ghanbatt 10 have donated and amount of $4600 to the DOLLAR A MONTH FOR GHANA FUND, an initiative of the Ghana High Commission in Freetown which aims at supporting humanitarian causes in Ghana and Sierra Leone. The presentation was made on behalf of Ghanbatt 10 by Major General Nii Carl Coleman, Commandant of the Staff College of the Ghana Armed Forces who was in Freetown recently as the leader of a Medals Day Delegation to Ghanbatt 10. Major General Coleman on his own behalf and that of members of his eight-member delegation also presented $200 to the DOLLAR A MONTH FOR GHANA FUND. He commended the Ghana High Commission for its initiative and said that successive Ghanaian battalions in Sierra Leone fully identified with the aims and objectives of the Fund hence their continuous contribution. Ghana's High Commissioner to Sierra Leone, Kabral Blay-Amihere, who received the donation thanked General Coleman and the troops for their support and said that the project which is in its third year owes a lot to Ghanaian soldiers. He announced that the Fund will soon announce a list of beneficiaries for the year 2004. The Fund has since its inception in February 2002 supported the educational and health sector in Ghana as well as in Sierra Leone. The Contingent Commander, Colonel Cephas Kofi Yeguo and the Commanding Officer of Ghanbatt 10, Lt. Colonel Stanley Alloo as well as a cross section of the Ghanaian Community in Freetown were present at the reception in honour of the Medals Day Delegation at the Residency of the Ghana High Commissioner.